I have been on a sweet posting kick lately. It doesn't mean I have just about as many "main dish" recipes waiting to be posted. Because I do. This is one of them. 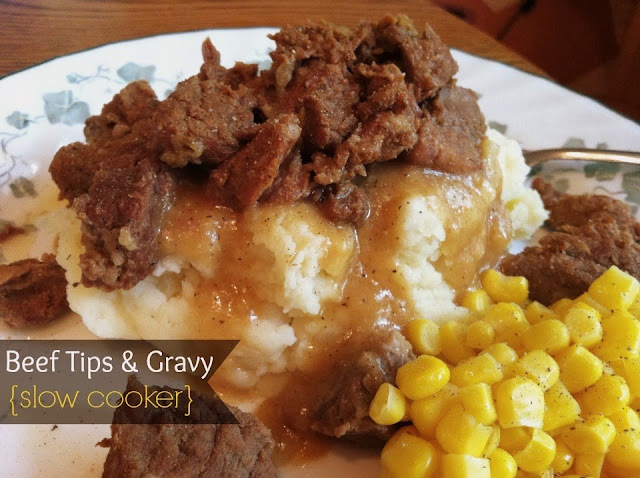 I have another post for a super simple Beef & Gravy recipe that uses condensed soup in the recipe. I wanted to try a recipe that doesn't involve creamed soup. This is the winner. I love this meal. I love tender meat. I love mashed potatoes. I love the gravy. I love slow cooker meals. Okay, who am I kidding, I just love food. Really love it. You will enjoy this. I am positive of it. Instead of using a slow cooker, you could use a dutch oven, or bake it slowly in the oven as well. You could use actual beef tips, or stew meat even works. I have made it with both and am pleased with the results every time I make it. Saute the onions and garlic together. Add salt and pepper to the beef, as much as you would like. Brown the beef in the skillet. Remove the beef and onions to a slow cooker. Combine the beef boullion cube and the 1 cup water, pour over the beef. Cover, set the cooker on low for 8 hours, or high for 4, until the meat is fork-tender. Mix the butter and flour together to form a paste, and add to the boiling liquid. Stir well, adding more flour if needed to thicken into a gravy. Serve the beef and gravy over mashed potatoes or egg noodles. Here I am again...lol. We are very busy in the summer and this was wonderful. I was able to serve a great meal and still get to our event on time. Thank you. I'm so glad it came out well for you! Thank you for the feedback! I'm so happy you are liking the recipes!